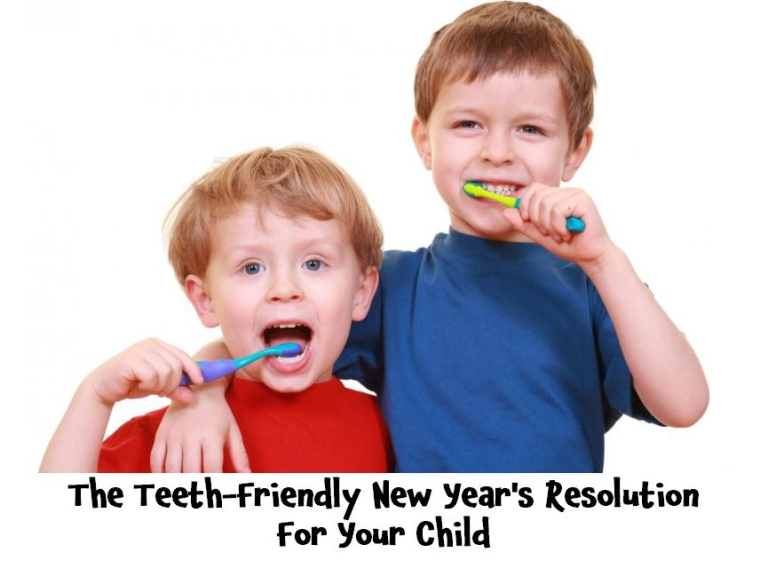 The Teeth-Friendly New Year's Resolution For Your Child. A New Year is a chance for you and your family to start afresh. Resolutions and personal goals are made in order to improve your general health and wellbeing, whether it is taking up a new hobby or opting to eat healthier. A way in which you could begin improving your family’s health is by changing little day-to-day things that would help everyone’s overall oral health. To set off on the right foot this New Year, book your whole family in for a check-up with your dentist. A check-up shouldn’t take long and it usually involves a quick examination to ensure that there are no signs of tooth decay or gum disease. If you or one of your family members does require another appointment, make one as soon as possible. If all is well with your family’s oral health, then your dentist will ask you to make an appointment for another check-up in six months time. Change The Family’s Eating Habits. Say goodbye to sugary sweets, soft drinks and crisps. Not only is this the best thing for your family’s general health, but it can also drastically improve the quality of their oral health. When it comes to preparing your child’s packed lunch, don’t include sweet drinks, chocolate bars or bags of crisps. Instead, substitute crisps for bags of mixed nuts. For the child with the sweet tooth, opt for apples or other teeth-friendly fruits such as strawberries instead of chocolate or sweets. Dried fruits may be healthier than chocolates, but they contain a lot of sugar and can stick to your teeth so they may be no better from a dental perspective. Make sure that the lunch box includes a bottle of water rather than a carton of juice or a fizzy drink. That way you are sure your child is getting enough nutrients and drinking enough water: the perfect ingredients for a healthy mouth. Establish A Good Oral Hygiene Routine And Stick To It. If you haven’t already done-so, this is the perfect time to implement a good oral hygiene routine within your home. This means that your child should be brushing and flossing twice daily, once in the morning and again before they go to bed. To ensure that your child is sticking to their New Year routine and that they are brushing for two minutes at a time, you should supervise them. If your child really doesn’t enjoy brushing their teeth, try downloading an app that is designed to make tooth brushing a little more fun. Disney has joined forces with Oral-B to create The Disney Magic Timer: the app for brushing time. Dr. Chig Amin is the owner and principal dentist of the Epsom Dental Centre. Dr. Amin practices gentle dentistry and ensures that all of his patients receive the dental care that best meets their needs.